WASHINGTON, D.C. – On Friday, April 19, the National Junior Duck Stamp contest was held at Patuxent National Wildlife Refuge in Patuxent, Maryland. EDITOR’S NOTE – This is the first of a two-part series looking at the local impacts of the WOTUS rule changes. Part II will be printed next week. MADISON COUNTY—Beavers may not be the primary animal that visitors to Big Sky Country come to see, but perhaps they deserve a little more attention. HELENA - Montana’s Republican Senator Steve Daines and Democratic Senator Jon Tester joined congressional representatives and conservationists for a press conference in Washington, D.C. on Thursday, November 29 to call for the permanent reauthorization of a program first established by President Lyndon Johnson in 1964. 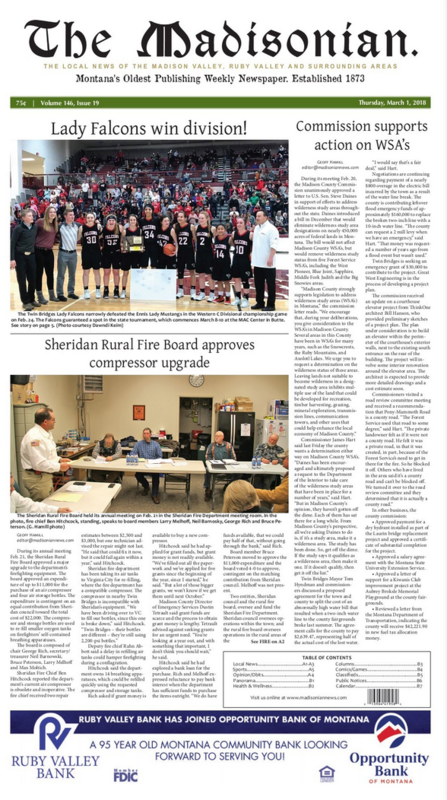 SHERIDAN—The Ruby Habitat Foundation does a lot of things, but there are some workings of nature that they simply can’t control.